For most events, the exterior doors will open one hour prior to the scheduled event start time. The Elevator is located in the south west corner just inside the ADA / Garden Entrance on the left. Restrooms may be found on all levels. Accessible (ADA) restrooms may be found off of the ground floor (Ballroom) lobby & across from the elevator on the balcony/third level. All parking is free for Stambaugh Auditorium Events. Please call ahead for ADA Parking. There is ADA accessible seating for all events. ADA accessible seating in the Concert Hall is available on the main floor only. Balcony & Gallery are not ADA accessible. 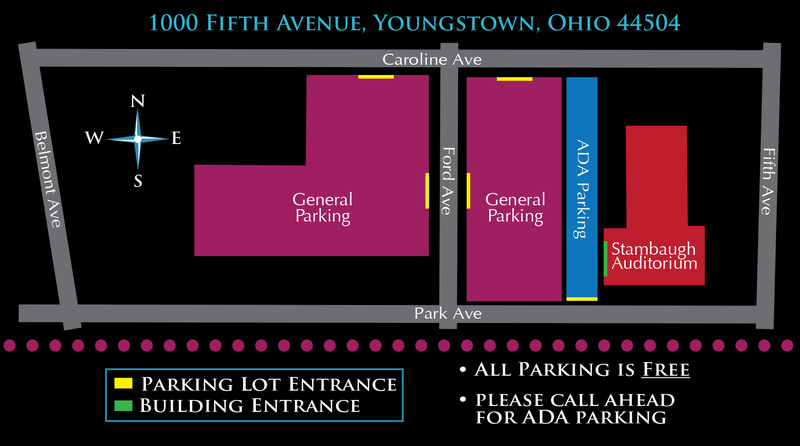 Please call the box office if ADA accessible seating is needed. Events and prices are subject to change or cancellation. Ticket Service Fees of up to $5.00 may be assessed to the face value of each ticket purchased. All sales are final. Tickets cannot be refunded, returned, or exchanged. Other restrictions may apply. Chelsea Chen has electrified audiences throughout the United States, and beyond. As a composer, she is broadening the classical organ repertoire with her own works based on Asian folk songs. She has received recognition since premiering her own “Taiwanese Suite” (2003) and “Taiwan Tableaux” (2007) at the Spreckels Organ Pavilion in San Diego. The recipient of the 2009 Lili Boulanger Memorial Award and winner of the 2005 Augustana/Reuter National Organ Competition, Ms. Chen is a graduate of Juilliard, where she received both her Bachelor’s and Master’s degrees. Artist accommodations provided by Courtyard Marriot Youngstown-Canfield.